Secretary of Energy Rick Perry testifies during a House Energy and Commerce Committee hearing on Capitol Hill in Washington, D.C., on Oct. 12. 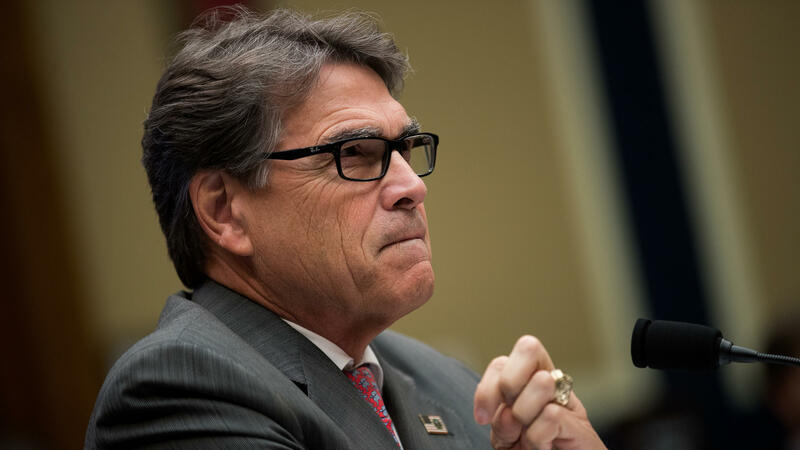 Perry's proposed rule to benefit nuclear and coal power plants has been rejected by a federal regulatory commission. A federal energy regulator has rejected a proposed rule that would have subsidized nuclear and coal plants, helping those fuel sources compete with cheaper natural gas and renewables. The rule was described by the Department of Energy as a way to promote the resilience of the electric grid — that is, its ability to provide reliable energy in the face of disruptive events like bad weather. But the Federal Energy Regulatory Commission said the rule falls short of "clear and fundamental" legal requirements, by giving preferential treatment to some resources with no evidence that the result will be "just and reasonable." The commissioners also were not persuaded that the rule would effectively address resilience issues — or, in fact, that the rule had anything to do with resilience at all. The decision is a blow to the Trump administration and to Energy Secretary Rick Perry, who have advocated for the rule. (Bringing back the flagging coal industry was one of Trump's signature campaign promises.) It's a victory for an unusual coalition of opponents — including the natural gas industry, renewable energy providers, environmentalists and free-market conservatives. The Federal Energy Regulatory Commission, or FERC, is a regulatory agency tasked with overseeing the interstate transmission of natural gas, oil and electricity. Four of its five members, including the chairman, were nominated by President Trump. "It suggests that to ensure grid reliability, coal and nuclear — so-called base load generators — should be paid to maintain a 90-day stockpile of fuel. Perry contends this would help prevent widespread power outages like those caused by the recent powerful hurricanes. "The coal industry and its supporters, like Perry, argue that coal and nuclear are a base load power that's needed to keep the lights on 'when the wind isn't blowing or the sun isn't shining.' But because coal and nuclear can't compete with cheaper (and cleaner) sources of power, they need to be subsidized. Perry also argues coal and nuclear are critical in extreme weather events, where on-site storage means power is there when it is needed. On Capitol Hill he specifically cited the 2014 'polar vortex' cold snap, although environmental groups point out that even coal plants had problems then, including frozen stockpiles of coal. "In fact, the Department of Energy's own recent 'grid reliability' study found the current grid is highly reliable, despite an ever decreasing amount of coal-fired generation. As the grid is further transformed there will be new challenges that have to be overcome, the report concluded. Still, as one energy commentator put it, Perry's proposal to subsidize coal and nuclear is a 'solution in search of a problem.' "
The five members of FERC largely agreed with those criticisms. "The Proposed Rule had little, if anything, to do with resilience, and was instead aimed at subsidizing certain uncompetitive electric generation technologies," wrote Richard Glick, a commissioner nominated by Trump. They emphasized that in rejecting the rule, they were not signaling a lack of interest in the stated goal of promoting resilience. "Although we terminate the Proposed Rule proceeding as discussed below, we are not ending our work on the issue of resilience," the commission wrote. "To the contrary, we are initiating a new proceeding to address resilience in a broader context." Instead of bolstering older fuel sources in the face of new competition, the regulatory commission is asking regional transmission organizations and independent system operators — the groups that actually manage America's electrical grids — to assess their own resilience challenges and evaluate how best to protect the electrical supply from disruption.